THE FIRST ELECTRIFYING ROMANCE IN THE KGI SERIES FROM #1 NEW YORK TIMES BESTSELLING AUTHOR MAYA BANKS. His brothers have tried to bring Ethan into the KGI fold, tried to break through the barriers he's built around himself, but Ethan refuses to respond...until he receives an anonymous phone call claiming Rachel is alive. It's been one year since ex-Navy Seal Ethan Kelly last saw his wife, Rachel, alive. Overwhelmed by grief and guilt over his failures as a husband, Ethan shuts himself off from everything and everyone. 4.0 out of 5 stars4 Why Didn't I Read this Sooner Stars! Ok, I know I said that there were three things and I repeated number two, but I really think that point warranted being mentioned twice. It is a really important point after all. Given the fact that the book not only contained ALL those key points but also managed to deliver them mixed in an exciting, romantic, suspenseful and action-filled story leaves me kicking myself for not picking it up sooner. I mean, come on, the cover alone should have been enticing enough, but no, like the fool I am, I kept skimming past it on my TBR. From the moment I began I knew that I was to love it and that I would not be able to put it down until it was over. I devoured this book and enjoyed every single second of it. I must say, that for my first Maya Banks book I was thoroughly impressed with her writing style. The story was gripping, the characters engaging and the emotion palpable. I loved the fact that whilst there was an intense romantic side to the story it was off-set perfectly with lots of drama, suspense and mystery. It flowed well and kept you on the edge of your seat. I absolutely love books with hot brothers (you’re shocked aren’t you?) who also happen to be either ex or current military and the six….. yes, you heard right SIX insanely hot Kelly brothers all fall into that category. I thoroughly enjoyed the beautiful close-knit relationship Banks weaved not only between the brothers but also their parents, Marlene’s “strays” and the people who worked for KGI. The only thing that prevented me from 5 starring it was that I had a little trouble completely giving myself over to the story. From the very outset we knew Ethan was keeping a huge secret from Rebecca and that when it was uncovered a giant storm was going to be unleashed, so I went into every page with trepidation thinking “is it going to happen now?” instead of just going with it. This is a personal fault of mine and is in no way meant to criticise the way the book was written. And in all fairness when the time came for it to be exposed, it ended up being more of a mild downpour than a huge storm, which I was actually kind of thankful for. So, after finally picking up The Darkest Hours and loving it, I am happy to announce that I am a huge fan of Maya Banks and her Kelly boys. I have already downloaded the next four books in the series and cannot wait to sink my teeth into them. 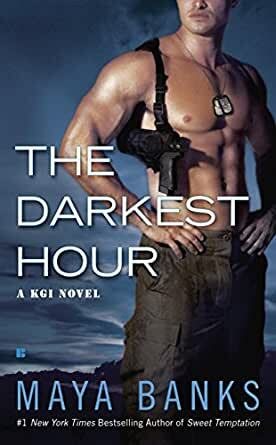 If you are a fan of military romance, second chances or just books with loads of incredibly hunky guys than this series is definitely for you! A good romantic suspense novel. Lots of drama, action and a slow burn, second chance romance. An emotional and touching story. Well written. Ethan & Rachel have a rocky relationship. Without giving too much away, they find each other again and become a much stronger couple. Not without bad guys and danger. A new favourite author. Well done Maya!